He had a life. He had a wife. Most of that is gone now. But, by God, he still has that piece of shrapnel. The call came late last week: an estate here in York. The gentleman was getting ready to downsize his housekeeping. He thought it was about time. He is 91 now; his bride of 63 years passed in January. The house is much more than he needs; he’s planning on an assisted living facility. Would I be interested in his books, and perhaps some of his stuff? The appointment was made, and I turned up on time and ready to go yesterday morning. Some books in the living room; more in the attic. I followed him up the stairs. It was hard watching him. He has a leg brace these days and he’s obviously lost a step or two from his prime. When we got to the attic, he mentioned that he had a locker of clothing. I wasn’t too interested, but I took a look to be polite. It wasn’t just clothing. It was full of uniforms . His uniforms. From World War II. He had been of the 4th Marine Division. The 4th Marines took Roi-Namur, Saipan, Tinian and Iwo Jima. By the end of the war, they had also taken an almost incredible number of casualties: 2,774 killed in action; 524 died of wounds sustained in battle; 14,424 wounded. This out of a peak strength of 19,709. Do the math; that's a 89.5% casualty rate. These were some of the guys who won World War II. He was one of the guys who won World War II. He landed on Iwo Jima in the third wave. That island, one of the bloodiest in the Pacific, was little more than a big pile of volcanic ash. You’d sink up to your boot laces with each step. The tanks were bogged down on the “beach” because even their treads couldn’t negotiate the stuff. It was hard slogging. The Japanese were dug in and cut off, so they had nothing to lose and everything to gain by dying for their Emperor. The locker contained several uniforms, including his dress blues. There were belts and ties. His ribbons. Cover (that’s Marine lingo for “hats”) of several descriptions. And several boxes of papers and mementos. Everything was in pristine condition. Those uniforms had been dry cleaned before being carefully put away. If you didn’t know better, you’d think that these pieces of history could have been issued to a raw recruit yesterday. In one envelope was a notice of his promotion to Staff Sergeant, along with his discharge papers. “I’ll just throw that out,” he said. 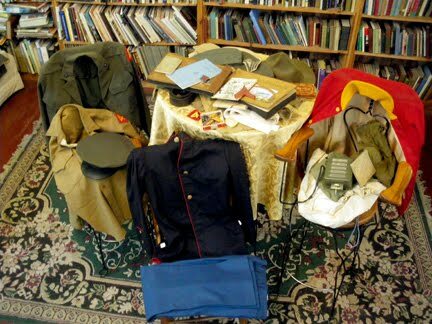 One box contained souvenirs: a piece of a downed Japanese Zero, Japanese currency and coins, captured books and personal effects (photographs, a toothbrush, postcards from the Japanese homeland). A banner of the Japanese Marines. Later, after the car had been loaded, we sat over a cup of coffee in his kitchen and he told me stories. One of the worst parts of the battle, he said, came each evening just at sundown. The Japanese would shell the 4th Marines with antipersonnel bombs. These were nasty things that were primed to explode right over your head and spit shrapnel--jagged pieces of metal,glowing red hot, and moving faster than the eye could follow. If you happened to get in the way and were hit you in the wrong place, you’d be dead instantly. The guys in his outfit would dig a shallow hole in the ash, jump in and cover it over with just a piece of canvas for protection. You couldn’t dig too deep because if you did you wouldn't be able to breathe with the sulfur coming up out of the ground. On this one particular night, a shell burst overhead. It killed a man standing next to his hole. But our guy managed to get under what passed for cover in time. Even so, shrapnel pierced his canvas and hit him in the foot. It didn’t pierce his boot, but it left one hell of a bruise. When I returned to the shop late in the day, I began to explore the various pieces and to paw through the boxes. More papers; more photographs. More artifacts. 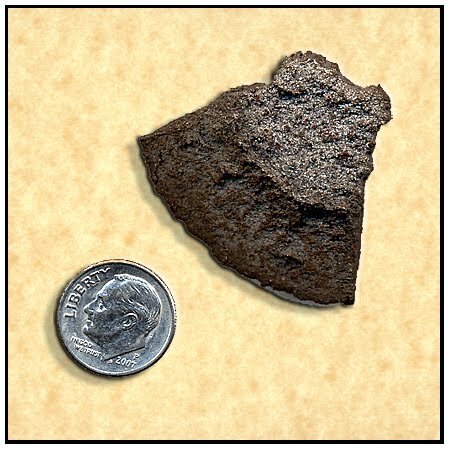 And, in the last box, a piece of shrapnel. I called him this morning. He hasn’t yet left for his new home. I made another appointment to visit him again tonight. He had a life. He had a wife. Most of that is gone now. But tonight, by God, he will have that shrapnel. Wow. Thank you for sharing his story here. And thank you for ensuring his history isn't lost. Awesome Story. I have nothing but respect for these guys. I have sat down with a few of these guys over the years and listened to their stories.. just amazing..
Jim--this was a powerful piece of writing! I almost cried as I read it. You caught the essence of the man and of the time. Wonderful! My pop was in the Navy and also went to Japan. His stories were something I listened to with awe. After he passed, I took the cigar box full of his pictures from WWII. I couldn't believe no one else was interested. Thanks for this story- these stories should be mandatory listening in our schools, artifacts included. Living history is a lost art. Thanks so much for your story and for rescuing pieces of history for the future! This is such a wonderful post. What happened when you took him the shrapnel? What was the look in his eyes? Is he still alive in his new home? Thanks for sharing the story. It touched my heart.